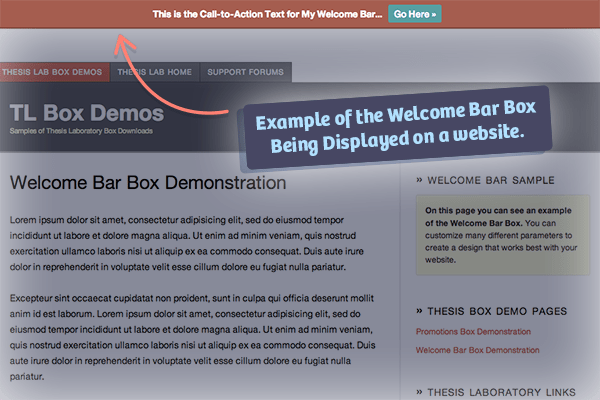 The Welcome Bar is a Thesis 2.1 Box and a great way to show off an important headline message to your readers. Similar to the popular Hello Bar and Foobar WordPress plugin but developed as a Thesis 2.1+ Box. The message bar is fully customizable; you can set background, text, button & border colors to mesh with your current design. A Simple, effective, light-weight way to make a statement to readers. Where do Welcome Bar box options show up after installation? Once the box is uploaded successfully there will be a new list item in the gray drop-down menu of your ‘Skin Editor’ named ‘TL » Welcome Bar’. You will also find this added to your skin content section. Where should the Welcome Bar box be placed? 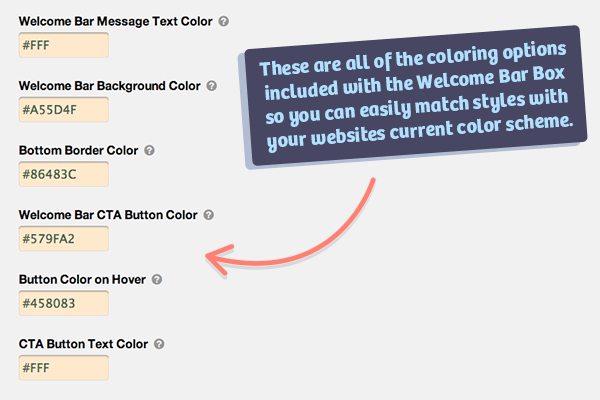 You should add the Welcome Bar box to the very top of your page templates. 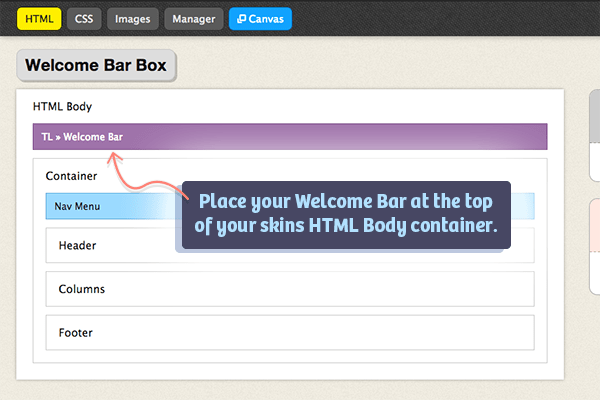 The box should be the first item inside your HTML Body container, just before your skins header container. What if the Welcome Bar has a gap above it? The most common cause for extra padding appearing above the Welcome Bar is when the WordPress user has the option for showing the toolbar while viewing the site selected in his or her profile. You can download this box for free using the button in the sidebar or at the bottom of the page. There is also an option to donate a few bucks if you appreciate the work ;). 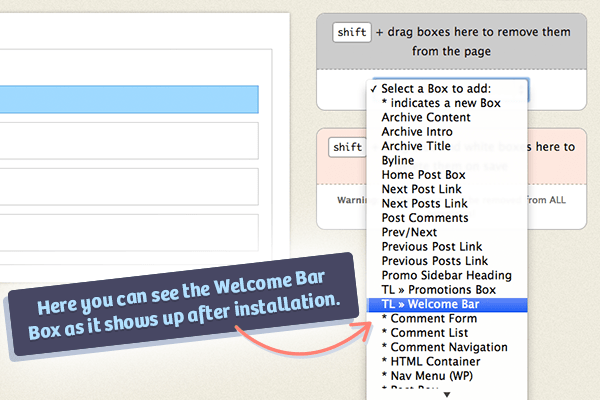 You can find support for the Welcome Bar Box on the forums page here feel free to ask questions & collaborate there. 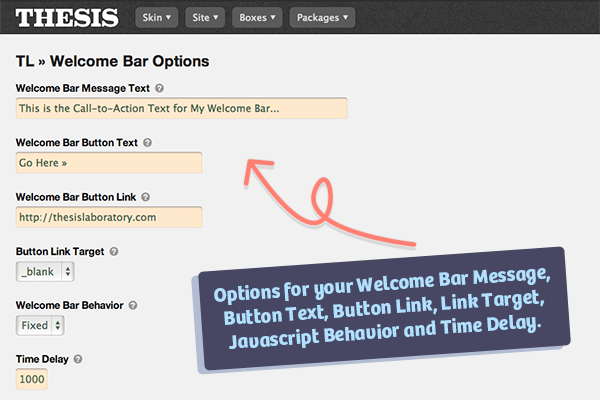 The Welcome Bar is a Thesis 2.1 Box and a great way to show off an important headline message to your readers. * Initial Release of Thesis Box.